No matter what type of heat treating demands your next rail project requires, you can meet them with help from Zion. Whether you’re designing a new railcar, modifying an old one or engineering something unique to transport special cargo, our certified induction heating services will keep your project on track. You can count on four decades of industry experience to bring added insight and lessons-learned to your project, when needed; our high standards backed by quality certifications to get the job done right, and our proven processes to get it done on time – so you hit all your deadlines. 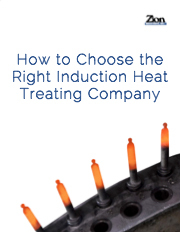 Why choose Zion for railroad heat treating? Engineers choose Zion heat treating solutions because of our quality work. They also love the perks that come with partnering the Zion team, such as engineering support and consultative services. And they know that at every stage of production and parts development, our goal is their goal. Even better, they enjoy accessibility to their projects – and to us. With three facilities (Michigan, North Carolina and Ohio), we’re convenient for clients in Pennsylvania, Kentucky and Tennessee too. Does your next railcar project need induction heat treating? If you’re curious about Zion or have questions about our induction heat treating services, send us a message. And if you have a railroad project that needs induction heat treating, please request a quote.